A US TOURIST has died in a road traffic collision in Antrim, close to the popular tourist attraction, the Dark Hedges. Police in Northern Ireland confirmed the identity of the man earlier today as Michael Munro from Orange, Connecticut. The 31-year-old died in a collision on the Gracehill Road in Armoy. 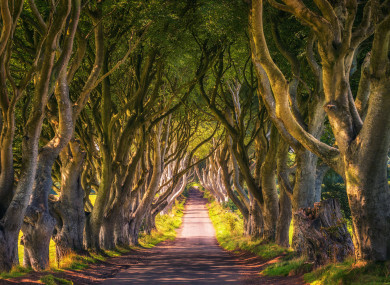 The tree-lined road, the Dark Hedges, was made popular after it featured on the tv show Game of Thrones. A woman in her 30s is currently being treated for her injuries which are believed not to be life-threatening. According to the Belfast Telegraph, Munroe had been visiting Northern Ireland on his honeymoon. Local councillor Darryl Wilson tweeted to say that he was deeply saddened by the news of Munro’s death and that the stretch of road he died on has been “a black spot over recent years”. Email “US man dies in road traffic accident near tourist attraction made popular by Game of Thrones ”. Feedback on “US man dies in road traffic accident near tourist attraction made popular by Game of Thrones ”.